Online retail (e-commerce) and mail ordering have grown tremendously in recent years causing a parallel change in existing logistic systems. The fact that a purchase is made without actually having experienced the product and that the customer needs to wait before the order is received, means that they will expect more from the delivery process, demanding accurate dispatch of their purchase. This means that information systems and packaging systems must be designed for a quick and flawless completion of the order. 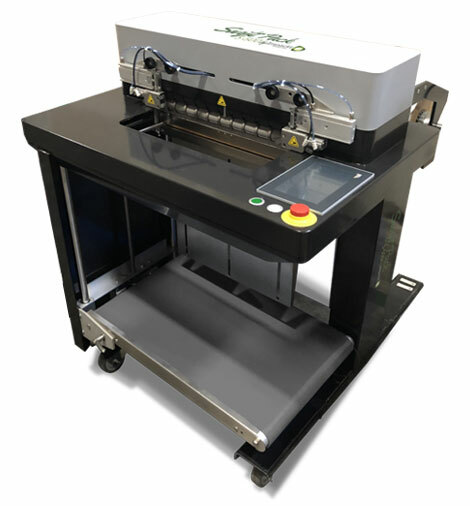 NPC Global is proud to present the Swiftpack S-500 Hybrid packaging system to suit this new trend in order fulfillment. This flexible packaging solution can be equipped with a barcode scanner, thermal printer and a variety of other accessories. The printer receives information from an external PC or input from a barcode scanner. This system ensures an accurate and efficient order fulfillment process and is twice as fast as conventional hand packaging.